Israel has ruled the Golan Heights since it was attacked by Syria in June 1967. In 1981, Israel extended its law to this region. And in March 2019, President Donald Trump recognized Israel's sovereignty over the Golan Heights. It was a welcome declaration, primarily because it lends authority to Israel's right to demand territorial revisions in order to establish defensible borders. The American declaration also serves several strategic interests. For example, the strategic plateau provides invaluable defensive advantages, and enhances Israel's deterrent power. Israel's control over the Golan Heights also increases the country's ability to prevent Iran from establishing an additional front against the Jewish state in southern Syria that would link to the front Iran had established in South Lebanon via its proxy, Hizballah. Israel's presence in the Golan, in proximity to Jordan's northern border with Syria, also reduces Iranian chances to undermine the stability of the Jordanian regime. Trump's declaration obviously helps maintain the territorial status quo on the Golan Heights. The same status quo provided quiet and stability, and is superior to other arrangements, even as compared to a peace treaty between Israel and Syria that is contingent upon an Israeli withdrawal from the Golan. Indeed, America's change of position erodes the "peace for territories" formula that rewards territorial concessions with peace. This article elaborates on these issues. 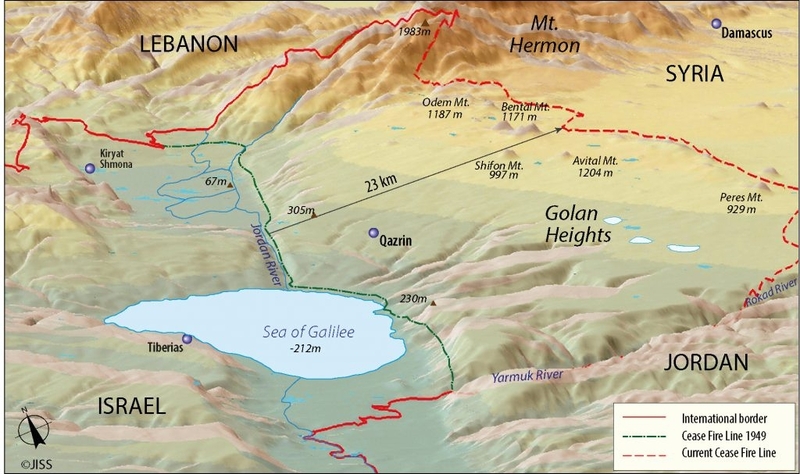 The Golan Heights is a rocky plateau, mostly ranging from 1,000 to 1,200 meters – an area totaling 1,800 km2 (695 square miles) north-east of Israel (see Map 1). 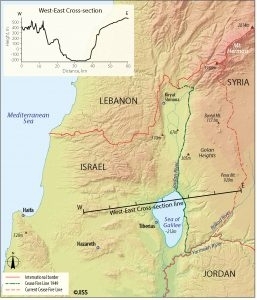 The Jordan River and the Sea of Galilee mark its western border, the Yarmuk River demarcates its southern end, and the watershed line bounds it on the east (see Map 2). Mount Hermon (partially in Israeli territory) marks the northern end of the Heights. The mountain provides excellent means to observe the entire region, up to Damascus, only some 60 kilometers away to the east, and over to the Haifa Bay on the Mediterranean to the west (see Map 3). The Golan Heights dominate the Jordan River Valley, the Israeli Galilee to its west, and the approaches to Damascus to its east. 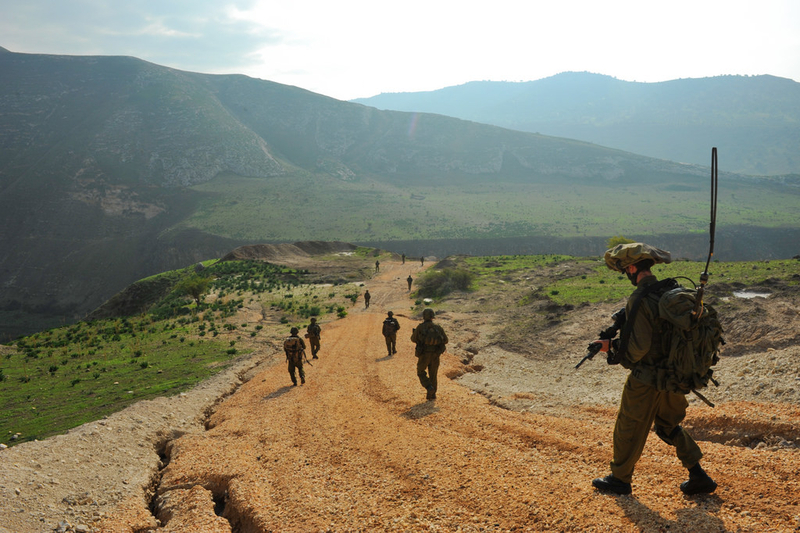 The current border along the watershed line – the hills in the eastern part of the plateau – is the best defense line against a conventional military attack from the east. Such an attack must overcome the topographical superiority of the defensive force, as the terrain requires the attacking side to channel its forces between the hills. The resulting natural terrain bottlenecks allow a small defending force to repel an attack, and even buy time to send for reinforcements, if needed. In the 1973 October War, the Golan's topography enabled 177 defending tanks to stop approximately 1,500 Syrian tanks, and gave the IDF the critical time to call up and deploy its reserve formations. An armored attack could hardly be successful without taking the hills that Israel presently controls, nor could it be sustained for long. 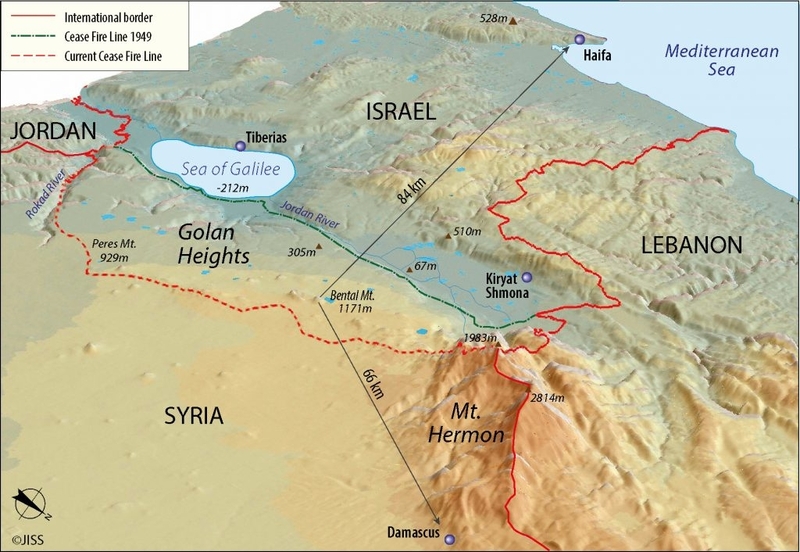 Control over the Golan Heights enhances the safety of the strategic Haifa Bay area on the Mediterranean Coast by extending the distance from Syrian positions to about 90 kilometers. The Haifa Bay area is an important concentration of industry and it hosts one of the two main Israeli ports. The Bay area is part of the strategically vital triangle (Jerusalem-Haifa-Gedera) that holds most of the country's infrastructure and population. Israel's control of one of the peaks of the Mount Hermon in the northern Golan also provides Israel with impressive intelligence gathering capabilities. It enables the use of electronic surveillance deep into Syrian territory, providing Israel with early-warning capacity in case of an impending attack. Similarly, the topographical superiority of the current defense line provides better capabilities for acquiring targets. The use of precise guided munitions, in particular, requires good intelligence, since, in the area of electronic warfare, sight lines are extremely important. Suggested alternatives to the intelligence stations, such as Airborne Warning and Control Systems (AWACS) and/or Unmanned Air Vehicles (UAVs) are not adequate. In contrast to an installation on a mountain, where they cannot carry heavy equipment, such as big antennas, and they can be shot down by anti-air missiles. Moreover, the amount of time they are in the air and able to provide intelligence is limited. Weather conditions may also influence the survivability of airborne systems. Surveillance satellites provide know-how, primarily about static targets, but are not useful for providing tactical intelligence. Even communication satellites have disadvantages, when compared to ground-based stations. The proximity of the Golan to Damascus (about 60 kilometers) has a tremendous deterrence value, because it puts the capital, the nerve center of the Syrian regime, within easy reach of Israeli military might. Moving the Israel-Syria border westwards denies Israel of this option and reduces deterrence, which in turn, invites aggression. Israeli control over the Golan Heights has provided a quiet border and any change might have destabilizing effects. Moreover, the technological offense-defense balance is not the primary factor in determining military outcomes; topographical constants can be a highly valuable asset. Strategists and militaries around the world still confer great importance to the topographical characteristics of the battlefield. Thus, the design of Israel's northeast border should not be shaped by ephemeral current technologies that seem to grant advantages to Israel defensive capabilities. The interactions between technology and strategy are complex, and the history of warfare shows that technological superiority and better weapons are not enough to win a war. Various security arrangements offered to Israel in order to compensate for withdrawal from the Golan are problematic.6 For example, the demilitarization of the Sinai (200 kilometers wide), which has had a stabilizing effect on Egyptian-Israeli relations, cannot be emulated in the 25 kilometers wide Golan. The Sinai demilitarization prevents a surprise attack from each of two states because the distance created by this buffer zone translates into warning time. In contrast, the small width of the Golan Heights is not enough to provide advanced warning of an imminent attack. In the event of the demilitarization of the Golan Heights, a Syrian surprise attack would face no opposition, and could enable, in just a few hours, the positioning of several armored divisions at the western ridge of the Golan Heights – the area that controls the northern part of Israel. The assumption that Israel would be able to preempt such a move is flawed. Syria may erode the demilitarization arrangements by salami tactics (minor violations of demilitarization that cumulatively and significantly change the status quo), which would make forceful Israeli responses to each violation in order to restore the status quo ante unlikely. Moreover, Israel might not always be aware of violations, as there is no way to erect foolproof verification mechanisms. Also, Israel might not have an early warning regarding Syrian plans to take over the Golan. The assumption that Israel might be able to reconquer the Golan Heights successfully is problematic. The staging areas of the IDF that are west of the Jordan River would effectively be within firing range of artillery and missiles, which would slow an Israeli response to retake the Golan Heights. Finally, international circumstances might curtail Israel's freedom of military action. Actually, Israel has been very fortunate in not concluding a deal with Syria involving withdrawal from the Golan Heights. At this time, Syria is still in the throes of a civil war and is not a peace partner. The future of the regime is not clear, while its intentions or its successor's intentions toward Israel are uncertain. Even if a more friendly Syrian regime were to appear, its capability to survive shifting political sands of the Middle East would be questionable. For example, the Muslim Bothers who took over Egypt were replaced by General Abdel Fattah el-Sisi a year later. Relying on peace treaties in a volatile region is shortsighted. Moreover, even a peace treaty with Syria, an unlikely development, would not be worth relinquishing control over the Golan Heights. Defensible borders are particularly needed considering that the threats on Israel's population centers and its strategic installations have increased in the 21st century. The worst-case analysis scenario for Israel is a war in the north against Hizballah, Syria, and Iranian militias. Iran wants to attain hegemony in the Middle East and to destroy Israel. Iran is also the rising power in the Middle East. Two of Iran's allies, Syria and Hizballah, are on Israel's northern border. Since the Egyptian-Israeli peace treaty (1979), Syria has seen Iran as its strategic partner to counter Israel's might. This relationship has been one of the most stable bilateral relations in the Middle East. Iran intervened in the Syrian civil war to save the Assad regime from collapse. Its Revolutionary Guards and militias, as well as Hizballah, fought on Assad's side. In the meantime, Iran also armed Hizballah with more than 100,000 missiles to threaten Israel. The Iranian military effort on the ground, coupled with Russian airpower, secured the regime survival. The Iranian intervention was part of a plan to establish a "Shiite Crescent" from the Gulf, via Iraq and Syria to the Mediterranean (and Lebanon), in its quest for hegemony in the Middle East. Iran's objective is to turn Syria into a satellite state, similar to the trajectory of events in Lebanon and in Iraq. The Trump recognition of Israel's sovereignty of the Golan signals that the US still is an actor in Syria. Possibly, the Trump administration that intends to limit its military presence in Syria bolsters the Israeli position in the Syrian arena because of its withdrawal plans. Washington realizes that Israel is the only American Middle East ally that can obstruct Iranian plans in Syria. While Israel refrained from taking sides in the civil war, it has conducted military operations against Iranian military entrenchment in Syria. Israel's objectives in Syria have been to prevent the upgrading of the Hizballah missile arsenal and the possibility of establishing an Iranian forward base in south Syria, close to Israel's border. Israel fears a new front from which commando and missile attacks can be launched. Indeed, Iran and Hizballah have made attempts to establish a new front on the Syrian side of the Golan Heights – so far, they have been futile. Iranian proximity to Israel's population centers is significant because the Islamic Republic's presence may deter a potential Israeli attack on Iran's nuclear installations. The American declaration about the Golan strengthens Israel's position in defending Jordan from Iranian attempts to undermine the stability of the Hashemite Kingdom. Jordan borders south Syria, and shares the Israeli interest in keeping the Iranians out of that area. One Iranian objective in its attempt to bring Syria under its influence is access to the Jordanian border. The Jordanian territory could become a corridor to the Palestinian Authority, located west of the Jordan River, which Iran plans to transform in to a second Gaza. Jordan also shares a border with Saudi Arabia, which is also a subject for Iranian subversion. Israel has a vital interest in preserving the stability of Jordan and its current foreign policy orientation. A glance at the map shows that Jordan, a pro-American state, serves as a buffer between Israel and the stretch of countries that are under an Iranian spell, going all the way to Pakistan. Turkey, another non-Arab rising Middle East power, is also involved in designing the new map of Syria. Under Erdogan, Turkey's Ottomanist and Islamic impulses have intensified. Moreover, it turned anti-Israeli. Israel cannot expect Turkey to help it in checking Iranian ambitions, primarily because Tehran and Ankara are inimical to Kurdish interests. Moreover, the Islamic coloration of the Turkish foreign policy brings the two countries together, which minimizes the weight of real-politik considerations. Both states see themselves as leading agents in creating a new world order in which the West and the US have a much more limited role. The American recognition of Israeli sovereignty over the Golan Heights, even if it is not followed by that of other states, contributes to the maintenance of the territorial status quo. The status quo has provided for a quiet border since 1974, as Syria refrained from hostile activities in the Golan arena, despite its attempts to bleed Israel by proxies in the Lebanese arena. In the 21st century, Syria has released many statements about "resistance" to the Israeli occupation of the Golan, but no action has been taken. The status quo has proven tenable over the past 45 years, a longer time period than when Syria ruled the Golan Heights. Many pundits insist that the Syrians would never accept less than the entire Golan Heights as a condition for a peace treaty, pointing out that the complete Israeli withdrawal from Sinai set a precedent for all future dealings with the Arab world. Yet, Syria has been seen to behave pragmatically and bow to superior power. When confronted with international determination to force Syria out of Lebanon in 2005, Syria backed down. Moreover, in a territorial dispute between Syria and Turkey, Syrian behavior confirms the capacity for pragmatism. While Syria has regarded the annexation of the Alexandretta province as an unlawful Turkish occupation of sovereign Syrian territory, Damascus recognizes Turkish military superiority, and dropped its claim to that region, which is five times larger than the Golan. Moreover, this territorial dispute did not prevent Damascus from having diplomatic relations with Ankara. It will probably even agree to the additional Turkish conquests of Syrian territory during the civil war. The territorial dispute between Israel and Syria therefore should not serve as a pretext for refraining from recognizing Israel and having diplomatic relations with the Jewish state. With time, and taking into account the undisputed Israeli power, the status quo could become the bridge to better relations. Another reason for the longevity of the status quo, beyond the power differential between Israel and Syria, is the little international interest in the territorial dispute between Israel and Syria. The Golan Heights does not constitute a burning issue on the agenda of the international community. Many other interstate territorial disputes generate limited international interests and the status quo persists. For example, Russia's rule of the South Kuril Islands (since 1945), India's control of Kashmir (since 1947), Morocco's annexation of Western Sahara (since 1975), and Armenia's conquest of Nagorno Karabakh (since 1994) have been challenged by their neighbors for many years, with little success. The Russian invasion of Crimea is a recent example. Syria has little diplomatic leverage to enlist the international community in an effort to force Israel to withdraw from the Golan Heights. At the regional level, Syria's influence has waned due to its civil war. Moreover, at this particular historic junction, many Arab states share deep concerns about Syria's strategic relationship with Iran and its ascendance in the Middle East. They view Israel as a strategic ally facing a potential nuclear Iran, which reinforces the reluctant acceptance of Israel's presence by Arab elites. The "occupation of the Golan" has no international resonance and Syria is unlikely to harness any support for military action to recover the Heights. Even if a conflict with Syria cannot be prevented, the Israeli military presence in the Golan is important enough to justify the price of a future war. Yet, such a price can be reduced by making the appropriate military preparations, including plans for preemptive and\or preventive strikes, and by signaling clear determination of Israel's intention not to relinquish the Golan Heights even given the prospect of war. Interestingly, the current territorial "status quo" has limited international legitimacy. Israel's control of the Golan Heights is not disputed, as long as Syria does not recognize the State of Israel and does not sign a peace treaty with the Jewish state. Not even the Arab states expect Israel to unilaterally withdraw from the Golan without a peace treaty with Syria. Furthermore, in the past, international law recognized that a state that had previously been a victim of aggression and later ended up defeating the aggressor had the right to claim ownership over the territory it had conquered during the war. Syria, which opened fire on Israel without provocation in the 1967 War, was the aggressor. Lastly, the UN Security Council Resolution 242 from November 1967, the reference point for all peace-making diplomatic efforts in the Arab-Israeli conflict, postulates the need of the protagonists for "secure and recognized borders," indicating that security needs are an acceptable criterion for designing the borders between Israel and its neighbors. Israel can therefore demand revisions in the "Green Line" with Syria to suit its defense needs. In any case, its military power allows it to hold on to the current defense line. In a volatile Middle East, where Iran has aggressive plans against Israel and succeeds in extending its presence to Syria, defensible borders remain extremely important. Since Syria's formation after the demise of the Ottoman Empire (1923), the political entity that has had the longest possession of the Golan Heights is the State of Israel (52 years). Moreover, Israeli public opinion regards the Golan Heights, a very beautiful region, as an integral part of the Jewish state. Most Israelis have consistently viewed the Golan Heights to be a non-negotiable property and a large majority of Israeli public strongly opposes any withdrawal from the Golan. The Golan plateau constitutes the best defense against potential aggression from Syria. It adds to Israel's deterrence. Designing borders in accordance with current, but changing, military technology, and with transient political circumstances, is strategically foolish. The political uncertainty in the region, including the rise of Iran and its military presence in Syria, only reinforces Israel's need for defensible borders. The territorial status quo serves Israel's best interests and is viable. Preserving the status quo requires maintaining Israel's military superiority Furthermore, a Syrian challenge to the status quo is difficult diplomatically and militarily. The important point here is that the control of the Golan Heights justifies the potential price of an Israeli-Syrian War in the future. The Trump declaration erodes the "Land for Peace" formula. Linking withdrawal from the strategic Golan Heights to a peace agreement does not serve Israel's interests. The meager expected political returns to Israel from a peace treaty with Syria do not justify abandoning the Golan Heights. Syria is unlikely to adopt a pro-Western orientation and to abandon its alliance with Iran. Moreover, a peace treaty with Syria is not going to affect the diplomatic fortunes of Israel in the region and in the world. In fact, Syria, as well as the rest of the Arab world, has little to offer to Israel in economic or cultural terms. Israel hardly desires to integrate into a despotic, corrupt, and poor region. A strong Israel can maintain the status quo. Efraim Inbar is president of the Jerusalem Institute for Strategy and Security (jiss.org.il) and a fellow at the Middle East Forum. Shimon Peres with Arye Naor, The New Middle East (New York: Henry Holt, 1993), 77-78. For an analysis of the new perceptions of national power, see Efraim Inbar, "Contours of Israel's New Strategic Thinking," Political Science Quarterly, Vol. 111, No. 1 (Spring 1996), 48-51. Arye Kaspi, "Interview with Amnon Shahak," Al Hamishmar, April 25, 1993. Probably the best survey of the interactions between technology and war is Martin Van Creveld, Technology and War. From 2000B.C. to the Present (New York: The Free Press, 1989). For analysis of potential security arrangements, see Omer Bar Lev, Military Settlement in the Golan Heights and the Modern Battlefield (Hebrew) (Tel Aviv: Sifriat Poalim Publishing House, 1999). Saul Cohen, The Geopolitics of Israel's Border Question (Jerusalem: JCSS and Jerusalem Post, 1986), 8-9.